So you want to get that work meeting out of the way so as to work uninterrupted for the rest of the day. Or perhaps, you’d rather dispense with the lengthy power luncheon, where discussions tend to end later than planned, leaving you to rush to your next destination or worse — having to reschedule appointments. Enter the power breakfast, where high-placed executives and businessmen conduct meetings in a space less staid than both the traditional boardroom and the linen-clothed fine dining establishment — an inviting eatery where a contract may be signed, a deal sealed, or new acquaintance made over scrambled eggs, toast and juice. Typically the most frequently sacrificed meal of the day, the humble breakfast is now the de facto choice for professionals wanting their meetings to be relaxed yet efficient. “Time is tight, so sometimes holding meetings over breakfast is the most practical solution to free up the day for other tasks,” says private equity manager Kurt Wee, who holds four to six of such meetings monthly. His usual haunts include Shangri-La Hotel, Singapore’s Lobby Court and The Dining Room at Sheraton Towers Singapore, which are “conducive and comfortable places with a laidback setting”. Wee, who is also president of the Association of Small and Medium Enterprises (ASME), still holds power lunches on particularly hectic days, but finds they sometimes take longer than expected. “Breakfast meetings tend to end on time, because everyone has to get to work,” he adds. It’s no surprise, then, that the power breakfast concept has really taken off in efficiency-driven cities that claim never to sleep — New York, Washington DC and London — with restaurants such as London’s The Wolseley and New York’s Landmarc opening early to attract political figures, executives and even celebrities seeking nutritious meals accompanied by brisk, unobtrusive service. Hillary Clinton, for instance, is known to hold meetings at the Four Seasons Hotel in Washington DC and media mogul Oprah Winfrey at the East Bank Club in Chicago. But it is Big Apple hotspot, the Loews Regency Hotel on Park Avenue, that can claim to be the birthplace of the power breakfast. It was there in the 1970s that hotel founder Preston Robert “Bob” Tisch met up with politicians and businessmen — over breakfast — to try and save their city from decline during the fiscal crisis. Today, the hotel continues to play host to a mix of Wall Street financiers and businessmen from 7am daily. While power breakfasts may not have the same star power in Singapore, they are increasingly a common practice. Lime at Parkroyal on Pickering, for instance, hosts two to three breakfast meetings daily, while Clifford at The Fullerton Bay Hotel receives a steady stream of bankers, lawyers and senior executives weekly. Over at Sheraton Towers’ The Dining Room restaurant, between three to five power breakfasts take place weekly and among its clientele are local politicians, reveals Zareen Huang, the hotel’s director of marketing communications. Meanwhile, The Westin Singapore’s Seasonal Tastes sees an average of 10 sessions play out each week. “Power breakfasts are getting increasingly popular in Singapore as more businessmen and women are searching for external venues that are not only convenient for holding a discussion, but also great for hosting potential business partners,” explains Miriam Wolber, The Westin Singapore’s food and beverage director. Indeed, power breakfasts are gaining traction with executives. “Meeting early means one can start with a fresh mind, discussions are more relaxed, and things may be more productive,” says ASME’s Wee. 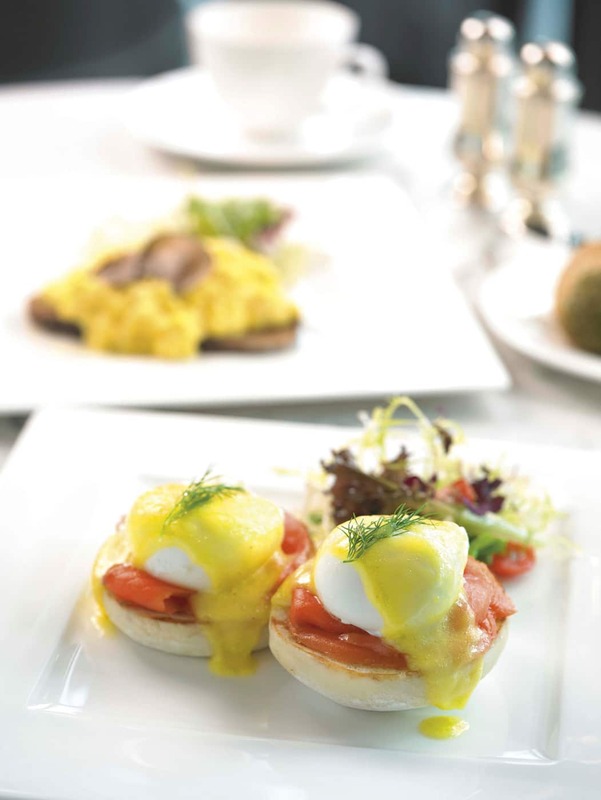 Bond with potential business partners over comfort food such as Eggs Benedict, muffins and waffles at this restaurant at The Fullerton Bay Hotel, which is conveniently situated by the Marina Bay Financial District. The establishment opens at 6:30am and has floor-to-ceiling windows that boast a view of the waterfront. Gorgeous interiors make breakfast an even more enjoyable affair that's worth waking up early for. With its cosy earth-toned interiors and picturesque backdrop of lush greenery and a cascading waterfall, The Dining Room at Sheraton Towers Singapore provides a tranquil setting for work discussions over breakfast. Tuck into pancakes and omelettes or local favourites such as congee and Nasi Lemak from 6am onwards. Enjoy a panoramic view of the city skyline and the Marina Bay waterfront while discussing business or sealing that multimillion-dollar deal at this eatery located on level 32 of The Westin Singapore. Open from 6:30am daily, it offers a range of pastries, salads, local delights and healthy fare, such as granola, muesli and fresh juices. Located within walking distance of the Central Business District, Lime restaurant at Parkroyal on Pickering is the new hotspot for high-placed executives. Breakfast, which comprises staples such as eggs and sandwiches, begins at 6:30am and the restaurant offers free Wi-Fi — useful if you need to retrieve online content during your meetings.